Starting A (6 Of God’s Days) Adventist Church? Starting A (Six Of God’s Days) Adventist Church? Good evening everyone, I ask each of you to be open-minded, patient and critical of this post as it is like no other post I have ever even considered doing. First of all it is not like I am anything that is more special that everyone else on this planet. I am not more important than you or anyone else, we are of all of equal value to our Creator. I don’t really like the term or thought that I am going to try to start “a Church” because Jesus is the owner of Christians Souls and bodies and “the Church” is “the Bride of Christ” which He will be collecting at “The Rapture” (second advent) so it (a new Church) is not new, Jesus is the Author and Owner of all Churches who worship Him. God’s Church was created when Jesus walked out of that burial chamber in 29 A.D. I have studied many Christian Churches teachings in the 51-52 years that I have been studying the Bible and have not found any who even understand what the Scriptures are telling us. In my studies of these different teaching I have found that I mostly agree with the teaching of the Seventh Day Adventist Church over all of the other ones I have knowledge of. I did say “I mostly agree” because I do have some disagreements with a few of their teachings. I know that the biggest ‘neon flashing light’ is that they believe that God created this planet in six human days even though it is more than obvious that no such thing is said in Scripture anywhere. Do you remember what the Apostle Peter said in the book of Second Peter chapter 3, verse 8? Quote, (NRSV) “But do not ignore this one fact, beloved, that with the Lord one day is like a thousand years, and a thousand years are like one day”. This is really a simple issue of excepting reality, please think about this for a moment, every planet that circles our sun has a different measure of what a day is. Why does anyone still think along the terms of human days as if the time it takes Earth to rotate should qualify as a measure when eternity is the subject matter? What is time to God? How much time is eternity, can it be measured? Humans have a huge problem with ego’s and ignorance. When a person Google’s the Seventh-Day Adventist Church beliefs you will come across what they refer to as “their 28 fundamental beliefs”. Number 6 is the one about their believing in the 6 human days of creation which we have already discussed. I believe that this ignorance on this one subject is the cause/reason why millions of people throughout the ages have laughed off Christianity as being total ignorance, at the cost of their own Souls. The next of their fundamental beliefs (#22) that I totally disagree with as saying the opposite of what the New Testament Scriptures tell us. Lines # 7 and #8 of their teachings says and I quote “…we are to adopt the most healthful diet possible and abstain from, the (unclean foods identified in the Scriptures). By Scripture this would only be true if you are a Jewish believer who does not believe that Jesus is/was the Christ thus following the ‘old law’ (Old Testament) that was given to the Lords people (Hebrews/Israel). With the resurrection of Jesus the ‘Old Law’ passed away and a “new covenant/New Testament” came into effect so no one is now bound to that law. Please consider what we are told in the book of Acts in chapter #10 verses 11 through 16, “He (the Apostle Peter) saw the heavens opened and something like a large sheet coming down, being lowered to the ground by its four corners. In it were all kinds of four-footed creatures and reptiles and birds of the air. Then he heard a voice saying “get up, Peter; kill and eat”. But Peter said “by no means, Lord; for I have never eaten anything that is profane or unclean”. The voice said to him again, a second time, “What God has made clean you must not call profane”. This happened three times, and the thing was suddenly taken up to Heaven”. If God says that all the animals are now clean and we are instructed to use them for food if we are hungry then why does any church say otherwise.? The last of these 28 beliefs that I have a problem with is about correctness with them on #27. Please read those 28 points as you read your Bible, there is a good chance that most people who call themselves Christians who have spent years studying the Scriptures will agree with most of these 28 points. Please understand that #27 which is talking about the millennium, the thousand-year reign of Christ after the Rapture. They teach that during that thousand years that the Devil and his Demons will have full total control and dominion of the earth but with no human beings on the planet during that time and that is just not correct by Scripture. To say this means that they do not understand what Armageddon is at all. The book of Revelation is really not very difficult to understand if you read it prayerfully many many times with a pure and unbiased mind and heart. Folks, Armageddon will be when the Devil, the Beast and the false prophet has waged all out war on Christians, at least those who refused to allow a Demonic government to place a computer chip in their hand, marking them as one of Satan’s followers, ‘the mark of the Devil’. Armageddon will be when Christ and His angels appear at The Rapture. This is when all the billions of people who have been fooled by the governments and their Demonic leaderships go to wage war against Christ Jesus and His angels. (Revelation 16:14) ( Revelation 19:19-21) (Revelation 20: 7-9) Demons will be cast straightway into the ‘lake of fire/Hell’ because they have already had their judgement day, leaving the “fooled” to be totally crushed like grapes in a wine-press. For all those who do not believe that Jesus is The Christ then they will all die a horrible death but this is nothing compared to after their judgement. So, now, how does one start a new “church movement”? Please study those 28 points of the Seventh-Day Adventist and please study the Scriptures prayerfully that relate to what they are saying. I know of no ‘Church’ that teaches exactly what I believe to be the ‘Gospel’ Truth. A few are close, but not exactly. So my question to you, exactly how would I/you/we start a ‘6 of God’s Days’ Adventist Church? I guess that I would not mind (but I am guessing about that) getting people together here in east-central Kentucky to start a Church but I would need devoted caring intelligent honest Christian people around me to ‘run the Church business’. The reason is, I have no health, if we were able to start an honest Christian Congregation the ‘Church group’ would need Deacons, Elders, and people who had the physical means to maintain the building and grounds. If one thinks about starting up any type of venture, you realize that there is a lot to it and with my health, I can do very little. Remember, if one starts up a ‘Church’ it has always got to be totally centered on Jesus Christ, not the Minister for the meaning of Minister is Servant! The people can never allow a ‘Cult’ to form around a Minister, not ever! This whole article is just conjecture as I do not expect anything to come about here where I live yet it would be nice if some places around the globe did start wanting to get back to the basics of love that is God’s teachings. It would be nice if this article is some small way helped nudge people into wanting to live and believe as the Scriptures of God speak to us to do. I know that physically I am 95-99% dead so really none of this article, this conjecture is about me, it is about all of you. I just want everyone to be saved once their life is over, and that does mean each and every one of you. Please take a few moments to leave comments on this issue, I would like to hear your thoughts, good or bad. I pray that God will bless you all, thank you for your time, Shalom. I know that there are a lot of people around the world who do not believe in Jesus as the Christ, God incarnate. Christians have a lot of the blame for this because so few Christians really have a clue about the meat of the Scriptures. We are good at quoting a verse here and there or telling you who begat whom or what order the Books are in but few Christians have a clue, even about the beginning of the earth and what we humans call time. I personally believe mostly how the Christians who call themselves Seventh Day Adventist believe except for the part about the earth being created in six human days. Folks I love you but this is stupid theology that cost millions from looking to the Bible for answers when so many Christians like Senator Ted Cruz of Texas spout this level of ignorance the people who might be leaning toward checking out the Bible instead turn from it. We humans these days think we are so smart, we think we can fathom time in millions or even billions of years yet we cannot perceive that time itself has no clock. But, do you think that the people of Moses’ time understood such equations? Even when things are in the simplest forms we sometime over look that which is obvious. For ‘argument sake’ let me say that I do not believe in any form of a ‘god’. I believe that everything that our eyes see is just some kind of cosmic mistake, a huge accident. For argument sake I convince you about everything on earth being this huge accident. But now I have to figure out how all of those cosmic accidents happened also, how planets all do exactly what they are doing all on their own. They all just fell into space the way they are, all the hundreds of billions of planets that we know of and all the ones yet to be discovered. Who knows how many billions, all accidents just empty nothingness perfectly tuned, by accident? Another thought about all of these planets, do we Christians really believe that all of these planets were created by a God? If so, then why? Why does anyone really think that God created billions of planets, was it just because He was bored? If you really believe in a God who created all this that we call Earth, then why do we think He created all those other planets for? Some say if we were to know about it then ‘it’ would be in the Bible. Um, that is sort of ignorant friends. Cars, clocks, buses, electricity, pants, glasses, none of these things and many more are not written in Scripture! God does expect us to have some common sense, to be able to think for ourselves, to not act so ignorant that we run off our own families. Now, what if Jesus is the Christ, ‘The Promised One to Israel’? What if He will be coming back to Earth one day as Scripture over and over again says that He will? Folks that event, the Second Advent (coming) of Christ is exactly when Armageddon will happen. The people will have sided with the governments of the world and will fight against Jesus and His Angels and the people will be crushed like in a wine-press who followed after the Demonic governments and fought against Jesus and His Angels. Then, Jesus will rule the Earth from the New Jerusalem which will come down out of Heaven. This is the error our Jewish Brothers failed to see about two thousand years ago in Jerusalem and it is the error that those faithful to the Jewish faith today still fail to understand. American media today has a hook through the nose of the average person. Media moguls are telling us what fashion is, what is ‘cool’ to do, and what is not. Back in the 1950’s the Washington politicians had all of the power over Holly Wood, now we have so many types of media available that it is the media who wags the tail of the politicians and the courts. American media and the small minority who say what can be printed or said inundate us with either government messages or corporate messages telling us what to buy, what to think, what to eat, what to do. It is also now very popular that our government and its allies (media) tell us how horrible Christian people are yet refrain from negatively commenting on any other religion because that would be politically incorrect, mean, and hateful. If you are a Christian person you/I are supposed to be loved based, caring, friendly and kind, not self-centered or hateful. If our attitude is what is keeping the people who meet us from asking us questions about Jesus, then we badly need to change our own ways before we close our eyes again. God (Jesus) is love, if we are preaching hate of other people then we do not know Jesus at all, we do not know God at all, Father or Son. What if Jesus is real? What if the Christian Scriptures are correct? What will you yourself do if you found out that He is an absolute truth, that Jesus really is exactly what the Scriptures say He is? I believe that this is a question that everyone will have to answer for themselves because I do with all my heart mind and Soul believe that Jesus is the Christ, God incarnate, the Son of Jehovah, The Father of all of us. I do believe the Scriptures to be the Holy Spirit inspired Word of God, it is the best ‘thing’ that we humans have to guide our lives by. I pray that each of you will come to love and trust in Jesus the way that I through time have learned to do and I hope that each and every one of you before you die will develop a faith way beyond my own this day. God bless each and every one of you, I pray for peace and love to fill your day and fill your dreams. In Jesus’ name, may God bless you and your loved ones for ever and ever. Presidents Xi Jinping, Vladimir Putin, Donald Trump: 3 Demonic Souls? I have been debating how to write this article for about a month now, I have even been debating how to word the title also. I had been thinking about making the title something like ‘Are These 3 Men 3 Beasts Of Revelation’, yet as I started writing the title I changed it to what you see now. Obviously I am trying to tweak folks interest enough to get them to take a few moments to stop in, read and contemplate what I am going to say to you here in this article today. I hope that you enjoy the read, I hope that I am able to get you to think and maybe even get you to reread the last book of the New Testament, the Book of Revelation. As this system that we all live in keeps getting worse as it and we are spiraling toward the ‘End Of Days’ spoken of several times throughout both the Old and the New Testaments. The Rapture, the second coming of Christ, will not come today or tomorrow, I can say this with total confidence simply because all of the Bible’s end of time prophecies have not been fulfilled yet. For those of you who are unaware of it the Rapture is when Armageddon will happen. Armageddon is when the governments and their armies and their people fight against God and His Angels and the people are crushed like grapes in a wine-press. When Christ returns one of the first things that will happen is the Demons who posed as world leaders will straightway be cast into Hell. This will happen because they have already been judged and found guilty by God. This is when the people will see and understand that they have been deceived by their Demonic Leaders and it will be too late for those poor Souls then. These humans are the ones who allowed these evil governments and their leaders to insert computer chips in their hands or in their head. This, is the ‘Mark of the Beast’, the Devil’s mark, the way that the governments will get all the people to bow down to them. As time closes out the broader circle of world power will continue to shrink into fewer and fewer hands. There will come a time when almost all of the worlds military and economic power will rest in the hands of 10 governments, 10 Leaders. This system will then be usurped by just 3 seats of power, then finally just one. I believe that the 3 world powers will come from 3 regions of the world. Please think of the globe in the means of north to south planes. One of these 3 great powers will come from Asia so almost without a doubt, China. Another of the 3 great powers will come from the center area. I believe that Russia in time will dominate Europe, don’t laugh folks, President Putin if he wished to do it can right now turn off the oil and gas to Europe. With no energy all of their economies will quickly implode or Russia could play the ‘good neighbor’ and end up having a seat at the EU table. Then you have the western hemisphere, the Americas, most likely dominated by the U.S.. These 3 will be usurped by ‘The” Anti-Christ who will come up from underneath them and the 3 will give all their power to their Master, “The” Anti-Christ which is the Devil Himself. Do I really believe that the 3 Presidents that I mentioned in the title are or will be the 3 who will control these 3 realms? Do I really believe that these 3 men are evil, yes I do. Everyone’s body is like unto a house and this house can only have 3 options, I am referring to the Spiritual plane . One option is the house is empty, anther option is the house is the dwelling place of God’s Holy Spirit, and the third option is that it is occupied by at least one Demonic Spirit. A demon can not enter where the Holy Spirit resides so they cannot share one house. Where the Holy Spirit is, no Demon is there. So, these three Presidents are just like you and I in regard to our bodies being a dwelling place, a house, a home. There is a such a thing as a person who chooses to be evil by their nature, one does not need a Demonic presence to be hate filled, egotistical and selfish, way to many humans manage that all on their own dime. Now do I believe that these 3 Presidents I mentioned are going to be the “big 3” very shortly before the ‘end of days’? Honestly, I think probably not, but is it possible? Yes it is possible, certainly these 3 men fit the profile and I believe that in China and in Russia their two current Presidents have no intention of ever letting go of the power they now have. Trump, who knows about this egomaniac. Pope Francis last year questioned Trumps faith and his being pro-life and Mr. Trump rebutted that “no religious leader should ever question another man faith.” A couple of things, yes, it is exactly what a religious leaders job is in part to question people’s faith. Yet in Mr. Trumps case it is my belief that you cannot question something that does not exist. I hope you enjoyed this little ‘future’ history discussion. I hope that you will take an hour or so and read through the Book Of Revelation again. I also hope that if you have any questions, please ask them I will give you the most honest and truthful answers that I know of. God’s love and peace I wish to each and every one of you, God bless. Is Elon Musk A Genius An Idiot Or Maybe Both? I have never met the man Elon Musk but I have read quite a bit about him during this past year or two. So, I do not know him personally so the best I can do is to garner what I can from him through his quotes. Personally I have no doubt that the man is a genius as far as his IQ is concerned. I have learned during my time here on this Earth that a person can be brilliant yet still do and or believe things that are just plain stupid. I also have learned that a person with a very low IQ can sometimes come up with great ideas, sometimes things in life simply are defined by the angle or the light in which one looks at the issue in question. This article today is going to be my opinions that I have taken from an article that I read this morning in ” livescience.com “. This article is one that I reblogged earlier this morning if you wish to read it before or after you read this article. When I write articles it is always my wish and attempt to get folks to think, to stretch their minds beyond their everyday plain, this article will be no different. I am not really saying that you need to agree with me but I hope you will take a couple of moments to consider what I am laying out for you to think about. This article today is one that does concern every ones life and their Soul. The Science article I mentioned to you a moment ago is concerning a company that Mr. Musk owns that is called ‘Neuralink’. Mr. Musk’s ambition with this company is to develop a “Ultrahigh-Bandwith Brain-Computer Interface.” Mr. Musk says one of the purposes is to ‘accelerate human evolution.’ He is not seeking to create pure machines like you see in the Terminator movies or even in the Will Smith movie simply called, AI. Mr. Musk says that “he sees a real danger in Artificial Intelligence” he has called AI a “fundamental risk to the existence of human civilization.” I believe that he is correct there as science, which is often pushed by military government funding seeks to have pilot-less aircraft, not just Drones, but also big Jets, folks the Navy has a sailor-less battle ship! Of course that will then lead to commercial airlines getting rid of all of their pilots. Think about it, driver-less cars, tractor-trailer units, driver-less trains. O yes, we already have this technologies don’t we? Think about factory jobs for a moment please. When I was in my teen years my Dad worked at a Chrysler Assembly plant in northern Illinois, back then the assembly line had far more employees putting together the units than what you see these days. Now machines directed by computer brains have replaced most of those ‘human’ jobs. Machines, computers don’t have Unions, don’t ask for pay raises, paid days off, overtime pay, medical benefits and that list goes on and on. Why let a human do what a computer can do much cheaper, and in most cases, better? Evidently Mr. Musk is concerned that we humans, starting with the poorest, weakest, least educated will only be a burden on society (the wealthiest people), if you are not a positive to society, why should you be allowed to live off of someone else (the rich)? What was Arnold’s phrase, ‘you have been Terminated’? Mr. Musk believes (and he is trying to accomplish this through his Neuralink Company) “that the best way to keep pace with the machines intelligence is to up grade human intelligence.” In the good ole days wasn’t that called going to school and getting the best education that you were able to get? From a pure science perspective Mr. Musk is correct on a couple of different plains. I believe that he is correct about his concerns regarding AI. Do you not believe that the servant can become the master? Could the humble public servant (politicians/bureaucrats/police) ever dare to become the master over the people? We already have, and we have had for many years now the integration of computer chips for people. It started out with chips for our pets so that they don’t get lost from us. Then we went into chips for new-born babies, just in case they ever got lost or stolen. Then came the chips for employees and their convenience. We have had little ‘brain’ chips for well over a decade now. Neuralink and Mr. Musk are now simply trying to stretch the human-computer ‘interface’ as he puts it. There will soon be a day where if you are an employee or if you are an office supervisor of importance that the company will require you to have mandated chip technology in your hand or you can’t get the job or the promotion. If you don’t think that what I am saying to you is logical or true, my friend it is you who are living in a fantasy world, not me. This last paragraph is going to be from my Christian Biblical viewpoint. We are told several times in the book of Revelation about the ‘Mark of the Beast’ being put into our hand or into our head, we are told that if we humans allow this that when Christ and His Angels return that we will die twice. The first death is when this body dies, the second death is when God severs His relationship with us and cast’s us into Hell for all eternity. Many will say things along the lines of ‘what has the Mark of the Beast got to do with computer chips’? I know that most folks still do not realize what ‘Armageddon’ really is. Scripture is very plain that Armageddon is when the Nations of the Earth and their Armies fight against God and His Angels at the Second Advent of Christ. We are also told that the people who are found to have the mark of the Beast in their hand or in their head will be totally crushed as if in a wine-press. Friends think about it for a moment, it is the governments which at that time will be led by Demons and Satan Himself that are going to fight against God, so yes, the governments will be even more wicked than they are now. Friends the mark of the ‘Beast’ is not the number 666, no where does Scripture say that it is. Simply there will come a time when 10 governments will control almost all of the globe and these 10 governments will sit upon the 7 Continents. Then the power will be consolidated into 3 all-powerful governments, then into one. Six is the sign of man, three is the sign of God. The world will have 3 all-powerful governments that are ruled by 3 of Satan’s top Generals. 3 Men who will try to take the place of God, as if they are God’s. Then they will give up their power to the 1 true Anti-Christ, Satan Himself. 3 Men (6’s) who would be God (3’s) if they could. Friends, all I can say to you as I close this article today is please for no reason ever allow anyone to ever put any kind of chip into you, please. MOSCOW — The diatribe against the Obama administration on prime-time television by a Russian Foreign Ministry official was hardly unusual in the long history of rocky relations between the United States and Russia. The administration “demonstrated the belief that the strongest has the right to create evil,” Maria Zakharova, the Foreign Ministry spokeswoman, said on the Christmas Day broadcast. From Washington’s perspective, it is the Kremlin that generally personifies evil, a point President Obama made on Thursday in punishing Russia for cyberattacks by directing new sanctions against Moscow and expelling 35 Russian diplomats. 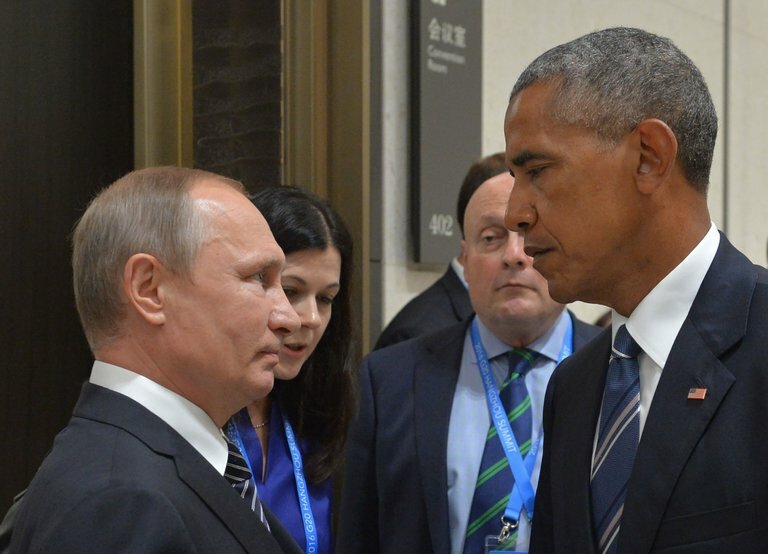 “The United States and friends and allies around the world must work together to oppose Russia’s efforts to undermine established international norms of behavior,” Mr. Obama said in a statement. The two statements appeared to be business as usual — each side representing enemy No. 1 for the other. By Friday that mood had been abruptly cast aside, however. President Vladimir V. Putin announced that Russia would do nothing in response to the new American measures, awaiting the next administration, prompting President-elect Donald J. Trump to call him “very smart” in a Twitter post. No clear agreements or even offers are on the table yet, however, bringing uncertainty. “Russia’s relations with the U.S. are currently up in the air — both sides have no clear strategy about how to move them forward,” said Aleksandr Morozov, an independent Russian political analyst. The latest crisis began in 2014, with a revolution in Ukraine that Mr. Putin labeled an American plot — he, as many Soviet leaders have, sees the hidden hand of Washington everywhere. Mr. Putin annexed Crimea and armed rebels in eastern Ukraine, prompting Western economic sanctions, which Mr. Trump has disparaged. The last confrontation under the Obama administration between Moscow and Washington came to a head this fall after American intelligence agencies concluded that hacking by their Russian counterparts had breached national security, cracking open the computers of the Democratic National Committee to reveal emails that embarrassed Hillary Clinton’s campaign. Mr. Trump initially encouraged the Kremlin to hack even more, breaking with all precedents, not least the Republican tradition of painting Russia as the evil empire, as Mr. Reagan called it. Senator John McCain, Republican of Arizona, plans to open hearings on Thursday on Russia’s efforts to manipulate the presidential election. Much of the Republican establishment in Congress endorsed the new sanctions imposed against Russia, putting them at odds with Mr. Trump. “The Russian cyberattack, and the misinformation and propaganda — they have been living with this for decades,” Ms. Klobuchar said in an interview. “I worry about what our relationship with other countries is going to be with a Trump presidency, if we buddy-buddy up to Russia and a leader who is not so democratic in nature,” said Alexis Matter, 35, walking through a Denver shopping mall. In Syria, President Bashar al-Assad is on the verge of reasserting control over much of the country, thanks largely to Mr. Putin’s intervention. Ukraine presents some problems, but has essentially boiled down into the kind of frozen conflict that Russia uses to destabilize independent-minded neighbors. And all of the attention on the cyberattacks made Mr. Putin look strong. Russian policy in recent years has been trying to sow doubt and undermine public faith in Western governments. The Kremlin has relied on a variety of levers — disinformation campaigns, buying influence, cyberattacks — which many analysts expect to show up in crucial elections in the coming year in France and Germany. Reporting was contributed by Ivan Nechepurenko and Andrew E. Kramer from Moscow, Alan Blinder from Sandy Springs, Ga., Julie Turkewitz from Denver, and Noah Weiland from Washington.